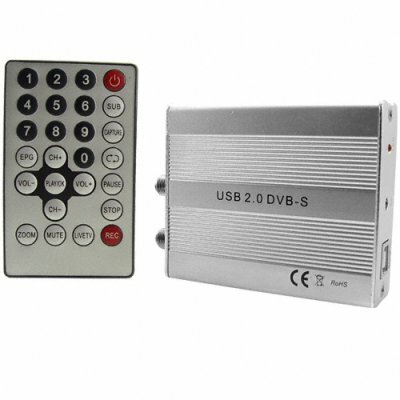 Successfully Added DVB Digital TV Tuner - USB to your Shopping Cart. DVB-T and DVB-S digital TV Tuner, now view all the beauty of digital TV on your PC! Why limit yourself to simple analog TV when you can have the best of both worlds, a system that receives digital TV (both DVB-T and DVB-S) and still works with standard analog. There's no better time to upgrade to a super sharp, stable and easy to use DVB digital TV system. Whether adding digital TV to the desktop as a second viewing and recording device or plugging into the media center of a Home Theater this TV tuner is sure to enrich your life. Installation is a breeze and once you've connected the digital TV tuner to your satellite or antenna you'll be watching digital TV in no time. Digital television has many great features to offer including electronic program guides, digital radio, and teletext. What's more, you're able to use the BlazeVideo software that comes with TV tuner to record all your favorite shows for later viewing or archival purposes. Be ready for the rising demand for DVB products by stocking up now for your internet or physical store and enjoy the profits to be made by Chinavasions low wholesale price available only to you, our loyal customers. DVB-T TV tuner for your PC. DVB-S TV tuner for your PC (satellite required).